Locally grown products are highlighted throughout our stores. We're committed to providing you with local, fresh and organic produce. At Down to Earth we are proud of Kevin’s enthusiasm, and we hope that our produce department inspires you, too. You’ll love our truly local, fresh, organic & natural produce! We buy produce from over 100 Hawaii farmers to bring you the best locally grown produce on the islands. 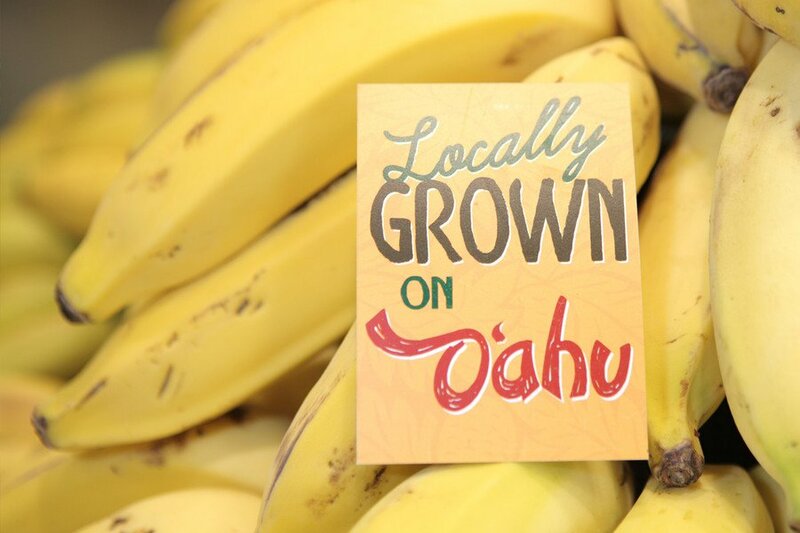 In fact, on any given day, between 40-75 percent of the produce we sell is grown in Hawaii! At Down to Earth you’ll find a wide array of locally grown produce, including herbs, lettuce, carrots, and greens, along with other local favorites like non-GMO papaya and an assortment of local bananas. We proudly carry locally grown apple bananas, avocados, non-GMO papayas, and a wide variety of greens and vegetables. And we carry unique tropical fruits and vegetables in season, such as Pitaya (dragon fruit), star fruit, lychees, breadfruit and lilikoi (passion fruit). Our commitment to local is so strong that we’ve created an exclusive Farming Liaison position – a team member dedicated to meeting and developing relationships with local farmers and vendors across the islands so we can continually increase the amount of local items in our stores. It’s that important to us. Buying local helps us to provide you with the freshest, healthiest produce possible. Fresh produce contains the highest possible amount of nutrients and enzymes. Working with local farmers also helps us to bring you the freshest produce year-round. Our local produce is one to two days from harvest to our shelves, and often it's on our shelves the same day. Fresh. Crisp. Just the way you like it! We’re proud of our efforts to source produce that is USDA Certified Organic. Organic standards mean that you can be sure produce has been grown without chemical pesticides and herbicides, sewage sludge, ionizing radiation, or genetic engineering. “Natural” is a term that has become increasingly misused in the food industry. It might be difficult for consumers to know if something is truly natural. When you shop at Down to Earth, you can trust that you are buying quality, natural produce—no genetically modified organisms (GMOs). We stand by our commitment to provide food as nature intended. Food that is good for you and good for the environment. Of course, a good produce department begins with a good manager, and Down to Earth has the best! Each of our five stores has an awesome produce manager who brings the finest possible fruits and vegetables into the store. Always ready to provide personal attention in helping customers to find what they need, our produce managers are a dedicated bunch who truly love what they do. And don’t be surprised when they turn up an unusual assortment of local produce you likely won’t find anywhere else. You might find sunchokes, celery root, fingerling potatoes, fresh figs, white pineapples, several varieties of mushrooms and a greens selection that will inspire you to eat salads every day!